So far, we have covered the basic operation of control panels and the initiating devices that place the pan- els in an alarm condition. We are now going to review the notiﬁcation appli- ances that are energized or “turned on” by the control panel. The term “notiﬁcation appliance cir- cuits” has undergone somewhat of an evolution in the past few years. These were designated for many years as “signal circuits”, “alarm circuits”, and also “indicating circuits”. 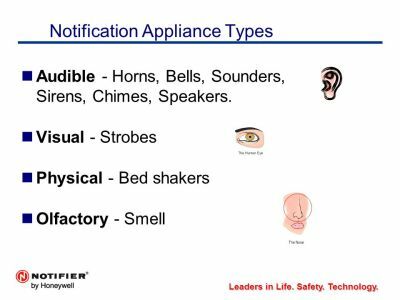 Revi- sions to NFPA Standards a few years ago adopted the term “notiﬁcation appliances and notiﬁcation appliance circuits (NACs)” to avoid confusion and misunderstanding and also to differentiate them from the commu- nication circuits used by addressable ﬁre alarm systems. Notiﬁcation appliances are divided into two very basic categories, au- dible and visual. Obviously, the audible appliances make loud noises and the visual appliances ﬂash bright lights. Recently, tactile devices have been developed for the hearing im- paired, but are used at the present only in very specialized applications and only as a secondary or ancillary unsupervised device. One example of this would be a “bed shaker” which is used to awaken the hearing impaired. Installed audible notification ap- pliances should differ from other audible devices in use in the area. For example, if a school uses bells to signal the start of classes, bells should not be used as notiﬁcation appliances in that building. The most widely used audible appli- ance is the horn. Horns presently on the market employ both electro- mechanical and electronic designs. In addition, the loud output requires a substantial amount of current to do the job. Other disadvantages are that only one tone is available, the breaker points create “spikes” which can be transmitted back to the control panel, and elec- tromagnetic interference (EMI) can be radiated from the area where the horn is sounding. Manufacturers have designed their horns to minimize these problems, but EMI in the past has been known to cause unwanted alarms from smoke detectors located immediately in front of the horn. One of the newest developments in this area is the “electron- mechanical” horn which uses the old familiar dia- phragm, but has an electronic circuit in place of the breaker points, much in the same manner as electronic ignition replaced the old automobile breaker points. This type of horn has the advantage of generating substan- tial sound output without the inher- ent disadvantages of breaker points. Electromechanical disadvantages led to the development of solid state horns, which mostly operate on a piezo-electric principle. These horns offer good sound output combined and have a much lower current draw. They also offer a variety of tones, with “siren”, “steady” or “warbling” tones being commonly available, often by merely selecting the proper jumper position inside the enclosure. The disadvantages of electronic horns presently on the market are their loudness and the fact that many electronic horns are not suitable for weatherproof use. The loudness of these horns is measured at a higher frequency than the electro- mechanical horns. While the decibel measurements are comparable, in actual applications the electronic horns sometime are not as audible to the average human ear, or especially to people with deteriorating hearing. Recent research indicates that a lower frequency tone, in the vicinity of 520 Hz is heard much more readily by people with deteriorating hearing. Sound output, of course, is dependent upon building construction, layout, furnishings, etc. The latest fire alarm requirements require a “temporal pattern” which requires the notiﬁcation appliances to sound three rounds of three blows each, with speciﬁed intervals between blows and rounds of code. Temporal patterns are usually programmed at the factory by the panel manufacturer and the installer need not be not be concerned with the proper time du- ration of the blows and rounds. The most the installing technician need be concerned with is selecting the proper jumper or programming the panel to provide this sound pattern. Bells have historically been associated with ﬁre alarms and are still in use today, although their use is rapidly decreasing due to the Temporal Pat- tern requirements. Bells presently in use usually range from 6 to 10 inches in diameter. The disadvantage is that it draws considerably more current than the vibrating or motor-driven bells and cannot operate on uninterrupted or “non-coded” current, as the bell would give one blow and then “hang up”. Vibrating bells draw moderate amounts of current, while motor bells usually draw less cur- rent. A disadvantage of the motor driven bell in the past was the ten- dency of the motor to stick or bind because it sat idle for long periods. To be sure, present manufacturers again have overcome many of the shortcomings, but these problems are inherent in the principle of op- eration. Vibrating bells do not lend themselves readily to Temporal Pattern signaling. Chimes operate in the same man- ner as bells, and are usually con- structed similarly to bells, using the same mechanism, only with a chime kit mounted in place of the gong shell. Chimes do not have adequate sound output for use as general evacuation appliances, but are mostly used in hospitals, etc. 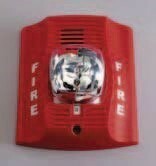 as prealarm or presignal devices to alert available personnel that an emergency exists and a general evacuation may be imminent. The last audible appliance is the loudspeaker. Obviously, these are intended for voice evacuation systems, and must be listed by a Nationally Recognized Testing Lab- oratory (NRTL) for ﬁre alarm use. Speakers are installed in supervised circuits and the great majority are used in high-rise buildings where selective evacuation is necessary due to the difﬁculty of evacuating a building completely in an emergency. The results of the 9-11 disaster indicate that this prac- tice is far from being resolved and much effort is now being dedicated to mass notiﬁcation measures. Visual appliances employed in the past included ﬂashing incandescent lights and various types of strobe lights. With the advent of the Ameri- cans With Disabilities Act, (ADA), only high intensity strobes are ca- pable of producing the light intensi- ties required. The ADA guidelines (ADAAG) have been updated in the recent past, are quite complex, and have been the subject of many lectures and much discussion. There was great confusion in the early days of the ADA, since the ADAis a federal law, enforceable basically in court, and local code enforcement ofﬁcials had no authority to either approve or interpret the ADA. In fact, these requirements have been the subject of entire publications and are beyond the scope of this article. Many state codes have been harmonized in ac- cordance with ADAAG guidelines, so now meeting these codes also satisﬁes the ADA, but not all codes have been updated in this fashion. Anyone planning to become involved with the layout of ﬁre alarm systems is well advised to consult one or more of these publications. And now to return to strobe lights. These have a high intensity out- put, with some providing a light intensity as high as 110 candela. Light intensity levels are deﬁned as CANDELA (effective candlepower) which is the measuring criteria per ANSI/UL Standards 1638 and 1971, and is deﬁned as the average light output generated during one ﬂash cycle. This should not be confused with peak candlepower which is im- mensely greater. Before strobes were standardized, some manufacturers used peak candlepower figures in their literature which led to some confusion. Other strobes in common use are rated as “15/75” candela, as they emit a 15 candela ﬂash when viewed from the side, but exhibit 75 candela when viewed directly. greater than 1 Hertz per second could induce epileptic seizures in persons afﬂicted with this disorder. There- fore, the ADA mandates a ﬂash rate between 1 and 3 Hertz/second. If two or more strobes are observable from a single location, synchronization of the strobes is necessary to meet this requirement. Microprocessor based panels currently on the market are designed to meet this. The other important thing to remember when using strobes is that the high intensity light output is directly related to current consumption. In many cases, the quantity of strobes required for an installation may exceed the capacity of a smaller control panel which might have a limited number of notification appliance circuits. Many of these circuits are commonly rated at 1.75 amp. maximum per circuit with a total panel limitation being somewhat less, such as a maximum of 3 amperes for both circuits combined. ALWAYS BE SURE TO CHECK YOUR SPECIFICATIONS AND KNOW YOUR PANELS LIMITS. It doesn’t take many strobes at .245 amperes each to exceed the capacity of such a circuit. In these instances, a larger panel or NAC extender panel will be required. These supply additional notiﬁcation appliance circuits and correspond- ingly larger power supplies. Strobe lights depend on the charging and discharging of a capacitor to ﬂash their xenon ﬂash tube. If the current to the strobe is interrupted or pulsed, it could interfere with the proper operation of the strobe. Micropro- cessor-based controls and extender panels are designed with provision for synchronization of strobes and temporal patterns for the horns. Strobes are most often mounted on horn and speaker covers so both the audible and strobe comprise a single unit. This makes for simpler wiring and combines both into a compact package. Strobes are also available in “stand alone” conﬁgurations and ceil- ing mount, although ceiling mount units do not at present completely meet ADA requirements, as the light intensity requirements are based on the strobes being observed directly, something difficult to do with an overhead device. Strobes are also available on plates which accommo- date bells or chimes, so they can also be installed in one package. Some jurisdictions require (erroneously) that only the audible appli- ances can be silenced after an alarm with the strobes continuing to ﬂash until the panel is reset. This practice has been criticized recently, as ﬂash- ing strobes indicate an evacuation signal to the hearing impaired. Until fairly recently, compatibility was not an issue as far as notiﬁca- tion appliances were concerned. The devices merely had to have the same nominal operating voltage as the noti- ﬁcation appliance circuit. The advent of microprocessor panels has resulted in some control panels operating at somewhat higher voltage levels, resulting in instances, depending on the supply line voltage to the panel, where the operating voltage was outside the range of some notiﬁcation appliance. This, in addition to ﬂash synchronization requirements makes it necessary for strobes and horns to be tested for compatibility with indi- vidual control panels. If there is any question about device compatibility, the panel installation manual or man- ufacturer’s compatibility document will list the compatible devices. The only exception to this compatibility requirement is for loudspeak- ers. There are no existing requirements at present. The main thing to remember, however, in the case of strobe/speaker combinations, the strobe is still subject to compatibility requirements.